The article I have excerpted below discusses how in Mexico, children born in prison stay with their mothers until the age of 6. Some people think it's ridiculous while others think it's beneficial to everyone involved, even though it's not typical of what most of us are used to or would expect. What do you think about this? While a prison may seem an unhealthy place for a child, in the early 1990s the Mexico City government decided it was better for children born in prison to stay with their mothers until they were 6 rather than to be turned over to relatives or foster parents. The children are allowed to leave on weekends and holidays to visit relatives. A debate continues among Mexican academics over whether spending one’s early years in a jail causes mental problems later in life, but for the moment the law says babies must stay with their mothers. So the prison has a school with three teachers. The warden, Margarita Malo, said the children had a calming effect on the rest of the inmates. The presence of children also inspires the mothers to learn skills or, in many cases, to kick drug habits that landed them in trouble in the first place. And even though the prison is full of women capable of violence, the children usually walk safely among them, as if protected by an invisible shield. 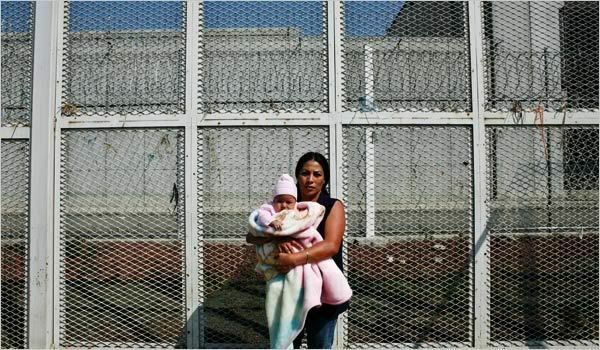 It is as though they tap the collective maternal instinct of the 1,680 women locked up here. I'm not sure how I feel about that. On one hand, it is a great idea, to keep the children with the mothers for 6 years. The mother's get to bond with their child and are forced to raise the child. OTOH, prison is no place for a child.